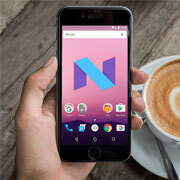 Android 7.0 - Nougat was rolled out by Google in the second half of 2016 and was initially available to only selected devices, but as the days went by this latest version of Android has rolled out to more devices. Android Nougat has been released packed with new features which are sure to catch everybody's attention. Nougat provides much better improvements and security features as compared to the previous Android version of Marshmallow. As announced by Google, Android 7 Nougat has released packed with almost 250 new features. Though all of them are not equally essential, there are some really good breakthrough features which can possibly change the way we use our smartphones. To make things easier, we have listed some of the best features of Nougat and the improvements in Android 7 in this article. Out of the sea of new features launched by Google in their latest Android version, Nougat, there are some which really caught our eye. Much more improved and refined as compared to the previous versions of Android, Nougat provides a more sophisticated feel to the entire operating system. This is one of the best features rolled out by Google in Nougat. With Nougat, your phone notifications are grouped into relevant packages which can collapse or expand with the tap of a button. Also, one can choose to reply, share, or open to view more from the notifications window itself. How it is better - Handling the endless list of notifications in the older Android versions which would line up in the pull-down window of the phone was a troublesome task. Nougat provides a neat notifications panel where the notifications are neatly sorted in groups on a per-app basis. With the advent of Nougat, Android phones are now able to handle more than one app simultaneously on the screen. This is one of the flagship features of Nougat, as it allows users to work on two different apps at the same time using the split screen mechanism. How it is better - Though this feature is not new and has already been seen in Samsung's Galaxy line of phones, this feature is improved in Android 7 and will be available to more devices. Now one can easily drag and divide the screen between the two apps, and also resize the window size for each app. With Nougat, one can easily swipe down twice to expand the quick settings tiles fully. Android users are used to using these tools more frequently as all the required features are available in one go in here. Android Nougat also allows users to add new tiles to the Quick settings without taking any additional steps. They can also control the set and placement of the elements on the panel. How it is better - The older versions of the operating system did not have the quick settings panel and users had to swipe down to open the quick settings menu. Now there is a dedicated pane which displays customized options for each user. Users also have the option to create multiple pages of tiles too. Android 7 security features for apps have improved the protection of private directories. This setting helps to prevent any kind of leakage of metadata from private files, like the file's size or existence. It secures the users from other apps to have access to their persona data. There is no permission in the apps to know if there is a file in the private directory or not. How it is better - The older version of Android operating system used disk encryption as compared to Nougat's file encryption method. There is a clear difference between device-encrypted data and file-encrypted content. This means that personal data is better protected in Nougat. How it is better - In the older versions, users could only change the font size but changing the entire display wasn't an option. Now people with vision problems can change the icon size and change the layout of the display as per their needs. The data saver feature in the latest Android operating system stops apps from sending or receiving data using your mobile network. When the data saver mode is on, all the network calls are forbidden to the apps which are working in the background and not included in the whitelist. It limits the data usage of the apps which are actively used. How it is better - The older versions of Android did not have the option of data saver which would result in apps sending and receiving network calls in the background. This would drain the battery unnecessarily and also waste the mobile data without the user knowing about it. This feature is especially useful in countries such as India where Google is trying to heavily push its services. The latest Android version, Nougat, comes packed with almost 72 new emojis. The color of the emojis can also be changed based on the color of the race. The usage of emojis in various applications has increased extensively and is one of the most common features in any chat application. It is available to the developers too, who can apply them in push notifications as additional elements. How it is better - The limited number of emojis in the older versions would limit the ways in which people would express themselves. With more number of emojis, developers have the option to design their apps making use of these new and improved emojis. Nougat allows users to set multiple locales as their primary and secondary languages on the phone. Users can now easily switch between the two languages as and when they want. Users also have full control on how much information needs to be displayed on the screen using the simple DPI changer in display settings. How it is better - In the older versions, it was time taking process to change the language settings. But in phones running Android 7.0, this feature can be used to toggle between two different languages in all apps easily. This is hugely beneficial for users who are bilingual or are frequently traveling. Outsource2india has been providing exceptional mobile application development and a host of other software development services to clients around the world. Our team of software engineers is trained to develop innovative and high-performance apps for our clients within dedicated timelines and with various project constraints in mind. We give life to the creative ideas of our customers and help them to take their business to the next level. Apart from Android, we also specialize in developing apps for iOS, Windows, etc. We follow a standardized mobile app development process keeping in mind the Android 7 features for business apps to create a functional and high-quality app at highly affordable rates. We are known to deliver results within a quick turnaround time through our multiple delivery centers spread across the globe. If you are looking for an accurate, efficient, and cost-effective mobile app development service provider, then look no further. Get in touch with us today!